I’m a writer (see the top of this page). I’m an actor, writer, director, and producer (see the bottom of this page). 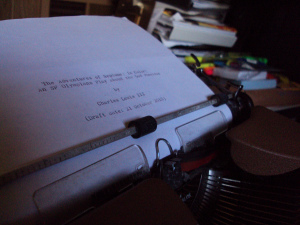 I use a manual typewriter (yes, the one you see below). I exercise out of pleasure. I’m a San Francisco native (yes, I was born here). I think the greatest song ever is Lauryn Hill’s “Everything is Everything”. I’m a Black man whose life matters. I love Shakespeare and will not rest until everyone sees the parallels between Richard III and Scarface. I love gangsta rap and classical opera with equal aplomb. I’d love to shoot a film on 70mm. I just wanted to say that I read your review on Macbitch, and I really, really loved all the things you had to say. It was an awesome and critical analysis of the work. Thank you for your words! How proud the above commenter must be. It wasn’t a term, it’s a phrase. There’s a chasm of difference. Seems you confuse easily so at least you’re honest about something. But… given your comment, I’m guessing you get confused quite often. You should look into that, sweetheart… especially if the only reason you commented was to defend an asinine (and also anonymous) commenter who confuses me with other people and advocates burning 📚. My Mom was into theatre in her younger days but I grew up in a very different environment.